Making TAX digital starts with the new interfaces fo submission of VAT in April 2019. for details and latest news please click the link below. FarmIT 3000 training videos offer a online insite to the eid readers, types and usage, watch them over and over again. FarmIT 3000 provides all you need for record keeping and analysis of your cattle. From service, to birth to slaughter FarmIT 3000 helps you track the animals performance along the way. Easy to use with all the official requirements you won't find a better package. The Sheep EID Solution is Here! Looking for an EID Solution for your sheep farm? Look no further. FarmIT 3000 works with a range of EID readers for Sheep, Cattle, Deer and Pigs. EID has always been part of FarmIT 3000 for over 6 years and we have been helping customers use EID to record all aspects of their sheep. Our largest customer has over 2000 breeding ewes all electronically tagged and fully recorded. We are happy to provide both hand held and static readers to suite your needs and offer free consultation. Whether you are a commercial or pedigree breeder, big or small, looking to do the minimum or benefit from the maximum, we have a solution for you. So don't hesitate - embrace the power of EID! Although we do not make EID readers we are a supplier of readers that are compatible with our software. We also have great experience of what exactly works in terms of reliability, ruggedness and functionality. This includes reader running windows mobile software such as the Psion Workabout pro and theAgrident APR 500. For more information on EID Readers please see the EID Menu or EID overview page. Tru-Test were purchased by Datamars in july last year(2018). Tru-Test in the UK is now being rebranded as Datamars. Although this should not effect product availability we can not guarantee prices at present, so please call. We would like you to try FarmIT3000 before you buy. You may therefore request a full version of the software with a serial number that will let you use FarmIT for a short period without any obligation. EID Sheep Weigh Crate from FarmIT. 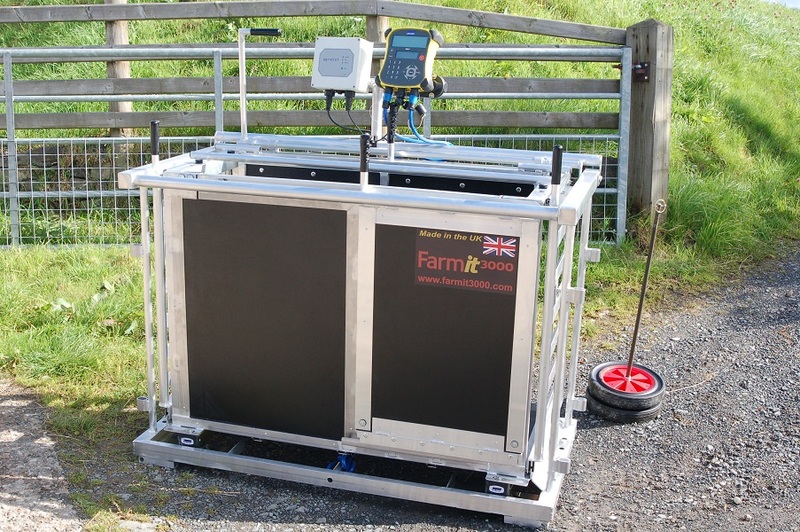 We have just completed trials of our new fully EID sheep weigh crate. Aluminium, Full EID, sliding doors....etc Read More! Provides full flexibility with EID. For those of you with requirements to collect and view a wide range of data whilst in the field, the Psion Workabout Pro with Agrident AIR200 EID reader and FarmIT Mobile offers a very flexible and scalable solution. The FarmIT Mobile software allows the recording of cattle, sheep and field data. Unlike other farming software, Farm IT3000 is the only fully integrated farm management software program providing a single program for Beef, Sheep, Dairy and Arable Farm Management. The software's ease of use, comprehensiveness and ability to produce meaningful reports makes it ideally suited to all farm businesses. Farm IT3000Gold integrates all the farm management records with an accountancy package tailored to the needs of the modern farm business. From only �399.00 + VAT you cannot afford to buy another program without first trying FarmIT 3000. Call 01938 820625 for a FREE no obligation fully working evaluation CD. Modules available for Dairy, Pigs, Poultry and Deer Breeders. The latest addition to the FarmIT 3000 Suite is the poultry module. Designed and developed with our existing customers it provides recording and analysis for both meat and egg producers. Agrident APR500 is great success with our customers. With improved layout design, better connections and improved performance, the reader builds on the success of the APR 350. The APR500 also features blue tooth as standard and has improved software for better functionality. Achieving Better Returns with EID. The electronic identifcation of sheep has been and no doubt will continue to be a subject which many of you have mixed feelings about. However for those of you who already record manually or wish to record information about your sheep then EID opens up a whole world of possibility. Mr Duncan Nelless is one such farmer. Duncan records over 1200 Lleyn ewes, lambing them outdoors! He also records details of sire, dams, lambs produced and breeding traits. Using Agrident APR500's the data is easily collected and with FarmIT3000 the data is easily analysed, and it needs to be! With over 1200 ewes and 4 years of data, that's a lot of lambs! The result is better returns, with an increase in breeding indexes and weight of lambs. . The data shows it's not always the best looking ewe at the end of August you should be keeping! Judge her on her lambs, if you know which ones they are?